Hemoptysis; Bronchial Artery Embolization; Recurrent Hemoptysis. Objectives: To analyze the safety and efficacy of bronchial artery embolization (BAE) in the management of hemoptysis. Methods: We conducted a retrospective study of 334 patients who had undergone BAE for hemoptysis from January 2007 to July 2013. Our study included 255 (76.3%) males and 79 (23.7%) females with an age range from five to 81 years old. All relevant arteries were evaluated but only those arteries that showed hypertrophy and significant blush were targeted. Polyvinyl alcohol (PVA) was used in all patients and gel foam was used in combination with PVA where there was significant shunting. Results: Mild hemoptysis was seen in 70 patients, moderate in 195 patients, and severe in 69 patients. On imaging, right side disease was seen in 101 patients, left side involvement in 59 patients, and bilateral involvement in 174 patients. Post-tubercular changes were the predominant pathology seen in 248 patients. Among 334 patients (386 procedures), 42 patients underwent the procedure twice and five patients underwent the procedure thrice. A total of 485 arteries were attempted of which 440 arteries were successfully embolized. Right intercosto-bronchial was the most common culprit artery present in 157 patients, followed by common bronchial (n=97), left bronchial (n=55), and right bronchial (n=45). We embolized a maximum of four arteries in one session. Immediate complications such as dissection and rupture occurred in only nine sessions (2.3%). Twenty-five procedures (6.5%) were repeated within two months, which were due to technical or clinical failure and 27 procedures (7%) were repeated after two months.Conclusions: BAE is a safe and effective procedure with a negligible complication rate. Our approach of targeting hypertrophied arteries was effective. 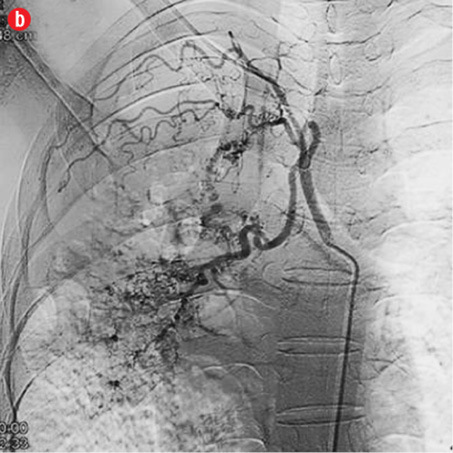 Bronchial artery embolization (BAE) has become an established treatment in the management of massive and recurrent hemoptysis. The majority of patients with massive hemoptysis are not surgical candidates due to poor pulmonary reserve and associated comorbidities. In specific conditions like aspergilloma, hydatid cyst, and tumors (like bronchial adenoma and carcinoids) surgery remains the treatment option especially when the hemoptysis has not responded to other forms of therapy. Even in surgical candidates, BAE is effective in preparing the patient for an elective surgery rather than a high-risk emergency procedure. Pulmonary tuberculosis continues to be a major public health burden in developing countries. It affects a large number of children and young adults.1,2 Despite adequate treatment, the disease while healing produces fibrosis, cavitation, and calcification leaving permanent sequelae in the lungs.3-5 For a significant proportion of patients, these sequelae continue to be a source of respiratory symptoms especially hemoptysis. 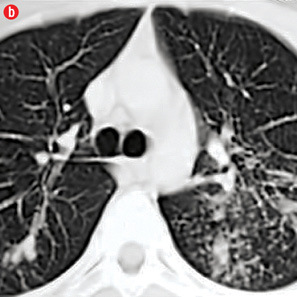 Such patients present with varying severity of dyspnea, hemoptysis, or recurrent secondary infections, and are often treated with anti-tubercular therapy repeatedly.6,7 This hemoptysis can be a result of a variety of sequelae and complications such as fibrosis or cicatrization, cavities, end-stage lung destruction, aspergilloma; airway lesions (including bronchiectasis, tracheobronchial stenosis, and broncholithiasis), or vascular lesions (including pulmonary or bronchial arteritis and thrombosis, bronchial artery dilatation, and Rasmussen aneurysm). In this retrospective analysis we sought to analyze the safety, technical success, and short and long-term outcomes of BAE. We conducted a retrospective study from January 2007 to July 2013 of 334 patients for whom BAE was performed for hemoptysis. During this time 386 procedures were performed in these patients. The protocol was approved by institute ethics committee. The patient population included 255 (76.3%) males and 79 (23.7%) females aged from five to 81 years (mean=41 years) [Table 1]. The severity of hemoptysis was classified as mild (less than 100ml/day), moderate (three or more bouts of blood loss of more than 100ml/day within a week), and severe (blood loss more than 300ml/day or more). BAE was performed in patients with mild hemoptysis whenever it was recurrent, not controlled by medical therapy, or hampered their quality of life. Clinical records were analyzed for degree of hemoptysis and the basic disease. Chest radiographs and/or computed tomography (CT) images were analyzed for evaluation of etiology and lateralization of abnormalities. Table 1: Age distribution of patients that underwent bronchial artery embolization. All patients had normal renal functions and coagulation profile at the time of the procedure. 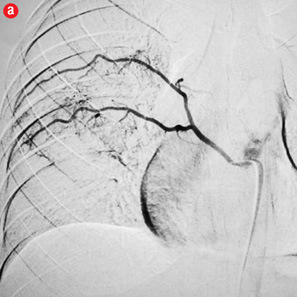 Angiography was performed commonly by using the right transfemoral approach. In four procedures the left transfemoral approach was used as difficulty was encountered in the right-sided puncture. Three transbrachial procedures were performed to approach the branches of subclavian artery with unfavorable anatomy. 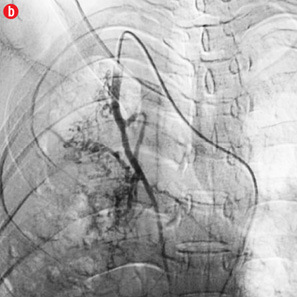 After obtaining arterial access, flush aortogram was obtained to search for bronchial or intercostal arteries supplying the diseased lung parenchyma. During flush aortogram water-soluble non-ionic contrast (Iomeron400; Bracco, Italy) was injected (25ml at 18ml/s) using automatic pressure injector after placing the tip of 5F angiographic pigtail catheter (Cook, USA) just above the level of the carina. The flow rate was uniform in all adult patients and in children the flow rate was adjusted according to their body weight. 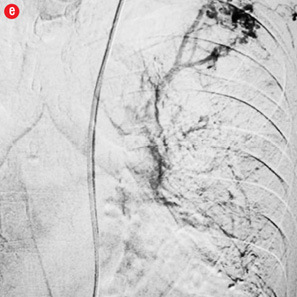 Subsequently, bronchial arteries on either side were searched using flush aortogram as a guide. They were selectively cannulated using shaped catheters (such as the 5F renal double curve, 5F Picard, and Judkins Left catheters) and selective angiography performed by hand injection of water-soluble non-ionic contrast. In addition to bronchial and intercostal arteries, branches of subclavian artery were analyzed in upper lobe diseases and inferior phrenic vessels were evaluated in lower lobe diseases. 5F Picard or 4F vertebral catheters were used for approaching branches of subclavian arteries and RC1 or RC2 catheters were used for cannulating inferior phrenic arteries. Selective angiograms were analyzed for dilatation and tortuosity, parenchymal staining, or shunting into pulmonary vessels (veins and arteries). All relevant arteries were interrogated. However, based on the selective run, those showing the most severe changes (a maximum of four) were targeted for embolization in a single session. Super-selective cannulation of arteries was done using a co-axial system comprising 5F/4F catheters and hydrophilic microcatheters (2.7F Progreat; Terumo, Japan or microFerret 3F; Cook, USA). PVA (size of particles ranging from 300 to 1000μ) was used in all patients and gel foam was used in combination with PVA where there was significant shunting. In a case of recurrent bleeding we also used liquid agent, n-butyl-2-cyanoacrylate (NBCA; 33% NBCA-Lipiodol combination). We did not use embolizing coils in any patient. The ability to selectively catheterize and embolize the targeted vessel was labeled technical success and the cessation or reduction of hemoptysis to a clinically insignificant severity was labeled clinical success. Patient underwent multiple or repeat procedures in the following situations: technical failure, for multiple arteries in which procedure was electively scheduled for a repeat session, and in cases of recurrence of hemoptysis. The procedure was repeated in those with persistent hemoptysis or when the solitary/dominant abnormal artery could not be embolized. In patients with multiple arteries, repeat procedure was only performed in cases of significant hemoptysis on follow-up. Therefore, in the analysis of patients with multiple procedures two groups were analyzed separately: those whom the repeat BAE was performed within two months of the first procedure, and those with more than two months gap. Follow-up records were searched for recurrence of significant hemoptysis (after initial success) necessitating reintervention. The time to such recurrences was analyzed, along with the outcomes after the reintervention. Patient records were searched for reports of immediate complications such as dissection or rupture. A record of any complications resulting from non-target embolization was noted as well as delayed complications. Table 2: Causes of hemoptysis in the patients. Among the 334 patients who underwent BAE, 69 (20.6%) patients had severe life threatening hemoptysis at presentation, 195 (58.4%) patients had moderate hemoptysis and the remaining 70 (20.9%) patients presented with recurrent mild hemoptysis. The duration of hemoptysis ranged from two days to 30 years. Sequelae of pulmonary tuberculosis such as fibrosis, cavitation, and bronchiectasis were the predominant causative pathologies of hemoptysis and were present in 248 (74%) patients. Acute infections, bronchiectasis, and tumors constituted the etiology in rest of our patients [Table 2 and Figure 1]. Few patients had rare anomalies like broncho-pulmonary sequestration14 and pulmonary arterial narrowing15 as cause. Aspergilloma within a preexisting cavity was seen in 55 patients. On imaging, right side disease was seen in 101 (30%) patients, left side involvement in 59 (17.7%) patients, and bilateral involvement in 174 (52%) patients. Right upper zone involvement was the most frequent observation and was seen in 229 (68.6%) patients. All lobes were involved in 15 patients. Figure 1: Etiology of hemoptysis in study group. (a) Thick walled cavity in right lower lobe suggestive of active infection. (b) Air space nodules in both upper lobes consistent with active tuberculosis. (c) Cystic bronchiectasis in left lower lobe. (d) Fibro-cavitary lesions and bronchiectasis in upper lobes suggestive of sequelae of tuberculosis. (e) Fungal balls in cavities of left upper lobe. (f) A mass in left upper lobe with surrounding ground glass in a patient with carcinoma lung. (g) Central bronchiectasis with bronchoceles in both upper lobes in a patient with allergic bronchopulmonary aspergillosis. A total of 386 procedures were performed in these 334 patients. We attempted to embolize 485 arteries of which 440 were successful. Right intercostobronchial (RICB) was the most common culprit artery in our study group which was present in 157 (47%) patients, followed by common bronchial (97 arteries), left bronchial (55 arteries), right bronchial (45 arteries) and others [Table 3 and Figures 2 and 3]. The number of arteries embolized per session were zero to four (mean=1.14). Table 3: Major arteries involved. Figure 2: Digital subtraction angiography spectrum of bronchial arteries. (a) Right bronchial artery. (b) Right intercosto-bronchial trunk. (c) Left bronchial artery. (d) Common bronchial artery. 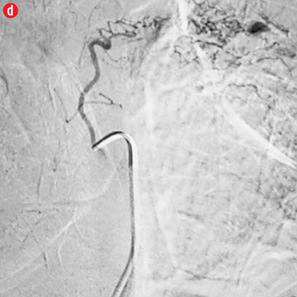 Figure 3: Digital subtraction angiography spectrum of non-bronchial systemic arteries. (a) Right intercostal artery. (b) Right internal mammary artery. (c) Left intercostal artery. (d) Left internal mammary artery. (e) Left cervico-thoracic artery. (f) Inferior phrenic artery. Three arteries were selectively cannulated but went into spasm and the embolization material could not be successfully delivered. All these three angiographies were performed using 4F/5F catheters prior to our routine use of microcatheters. Forty-two arteries could not be selectively catheterized. These included right intercostobronchial (RICB, n=3), right bronchial (RB, n=3), left bronchial (LB, n=14), common bronchial (CB, n=11), right intercostal (RI, n=2), left intercostal (LI, n=1), right internal mammary artery (RIMA, n=3), right cervicothoracic (n=2), left cervico thoracic (n=1) and right inferior phrenic (n=2) arteries. In 17 patients, no abnormal hypertrophied artery was found despite meticulous attempts to localize and cannulate relevant bronchial and non-bronchial systemic arteries. 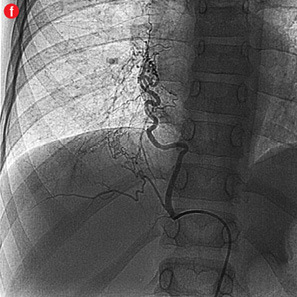 In one of these patients, a catheter could not be negotiated through the aorta due to a tortuous aortic course as a result of severe scoliosis. The procedure was subsequently performed through the transbrachial route in this patient. 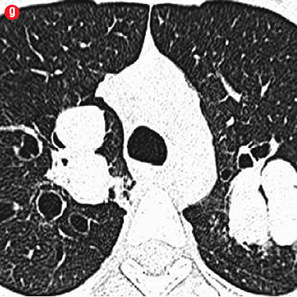 The underlying etiologies in these patients were post-tubercular sequelae (n=10), acute infection (n=2), bronchiectasis (n=2), sarcoidosis, extensive cystic disease and a normal CT (n=1) each. Eight patients had unilateral involvement (right lung n=3 and left lung n=5) and in an equal number the involvement was bilateral. 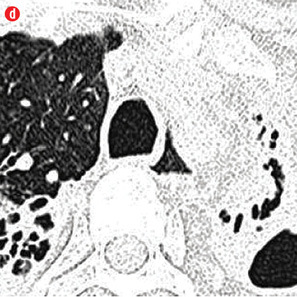 Ten of these patients continued to have hemoptysis but no abnormal bronchial or pulmonary arterial source could be identified on subsequent multi-detector computed tomography (MDCT). Among 334 patients, repeat procedures were needed in 47 (14%) patients. Forty-two patients underwent the procedure twice and five patients underwent the procedure three times. 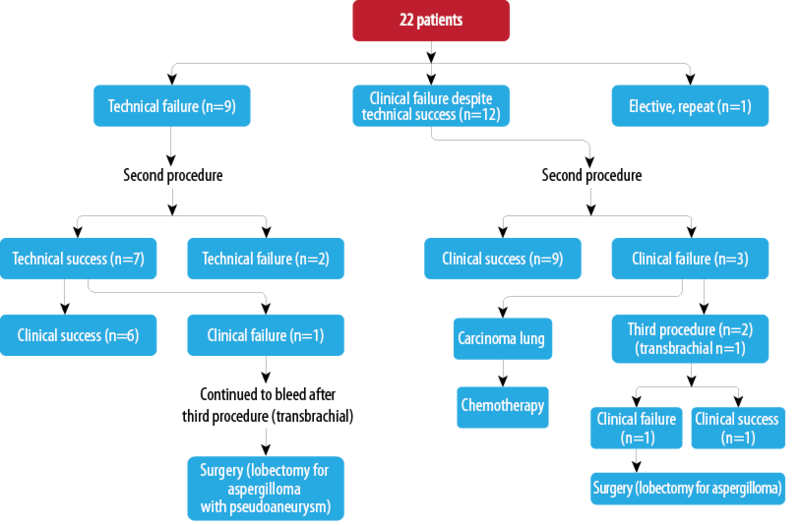 Twenty-five procedures in 22 patients (6.5%) were repeated within two months, which were due to technical or clinical failure of the procedure or elective [Flowchart 1 and Figure 1]. One patient with aspergilloma and bronchial pseudoaneurysm continued to bleed despite a third transbrachial attempt and this patient was taken for surgery (left upper lobectomy). The pseudoaneurysm was supplied through multiple small branches of the cervicothoracic artery and was observed in the delayed parenchymal phase. In one patient, the procedure was repeated electively, as he had multiple abnormal arteries which could not be adequately embolized in the first sitting. Flowchart 1: Repeat procedures within two months of initial embolization (25 procedures in 22 patients). Figure 4: Special scenarios. 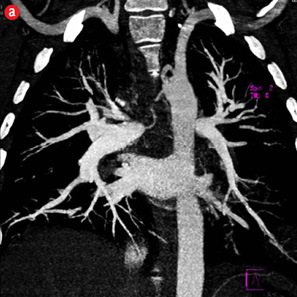 (a and b) Ectopic bronchial artery arising from left subclavian artery shown in multi-detector computed tomography and maximum intensity projection image and angiography. (c and d) Computed tomography and angiography showing aneurysm in left upper lobe cavity with fungal ball. (e and f) Transbrachial approach for subclavian artery branches. Twelve patients had clinical failure despite technical success of the first procedure. Most of them had sequelae of pulmonary tuberculosis (n=10) while active infection and carcinoma lung were responsible in one patient each. 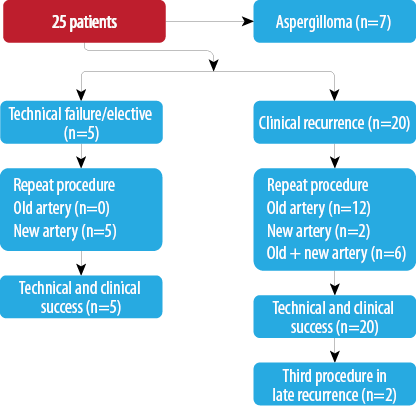 Six of the post-tubercular sequelae patients had aspergilloma. During repeat procedure, no additional abnormal arteries were found in five patients and the same artery was re-embolized. In seven patients, additional abnormal arteries were found and embolized. 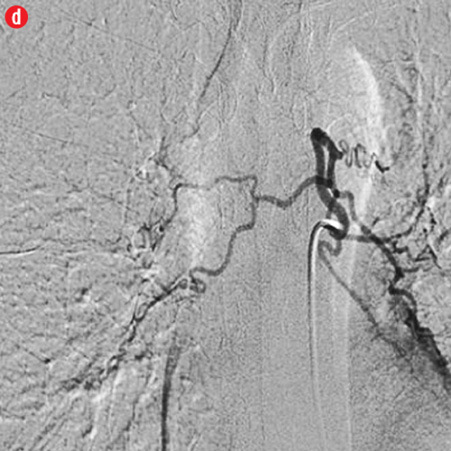 Additional bronchial arteries were missed in the initial angiogram and detected on a subsequent study in three patients. 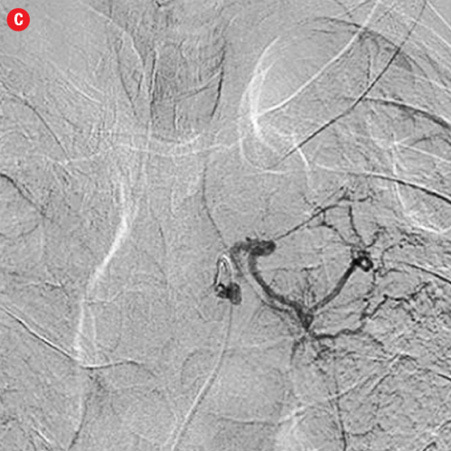 Two of these were ectopic with one arising from the left subclavian artery [Figure 4a and 4b]. In four patients, additional abnormal bronchial/non-bronchial arteries which were deemed to be insignificant on the initial angiogram were also embolized. Following the second procedure, cessation of hemoptysis could be achieved in nine patients while one patient with carcinoma lung and two with post-tubercular sequelae continued to bleed. One patient with aspergilloma was referred for emergency lobectomy after a third attempt. In two of these cases, the transbrachial approach was used to cannulate subclavian branches because of unfavorable anatomy of aortic arch [Figure 4e and 4f]. Flowchart 2: Repeat procedure after two months (27 procedures in 25 patients). Immediate complications such as dissection and rupture were observed only in nine sessions (2.3%) in which no active intervention was needed. Chest pain was the most common delayed complication and was treated with analgesics, and no patients required hospitalization or any form of intervention. Immediate and short-term outcomes of patients are summarized in Flowchart 3. On a long-term basis, as described, 25 patients reported with recurrence. Telephonic enquiry revealed the death of one patient due to recurrent hemoptysis and recurrence of moderate hemoptysis in three patients. Twenty-seven repeat procedures were performed in 25 patients more than two months following the initial procedure [Flowchart 2]. While most of them represented clinical recurrence of the hemoptysis; five patients were those with initial technical failure or multiple arteries. All patients had a clinically successful outcome immediately after the procedure. Among 20 of the patients with recurrence, the same artery was embolized in 12 of the patients, while new, additional arteries were embolized in two patients, and the same artery as well as additional arteries were targeted in six patients. Thus, additional abnormal arteries were found and embolized in eight patients (40%) in the repeat session. 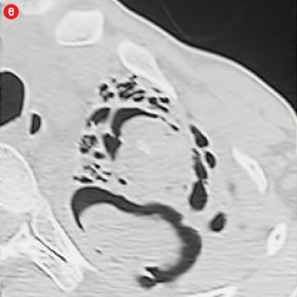 Cavitary aspergilloma was observed in seven patients with long-term recurrence. Two patients underwent the procedure thrice. One of them had extensive bilateral cavitary disease that over a three-year follow-up period developed an aspergilloma in one of the cavities. The second patient had post-tubercular sequelae with bilateral upper lobe fibrobronchiectasis. Flowchart 3: Immediate and short-term outcomes in all patients. BAE is an established technique in the management of patients with life-threatening hemoptysis. It is also used in cases of recurrent mild to moderate hemoptysis that has not responded to medical therapy. Initially, use of BAE was advocated primarily for management of massive hemoptysis. However, increasingly it is used in moderate hemoptysis and recurrent mild hemoptysis that hampers the lifestyle of the patient.9,10,16,17 The majority of our patients (58.4%) had moderate hemoptysis. Recurrent mild hemoptysis was present in 21% of patients and the rest had severe hemoptysis. In the majority of our patients (74.3%), pulmonary tuberculosis was the etiological factor. While in western literature, bronchiectasis and cystic fibrosis form the dominant group of clinically significant hemoptysis, in our study, as in other Asian studies, tubercular sequelae comprised the largest group.16-18 Most patients had disease in both lungs (52%). 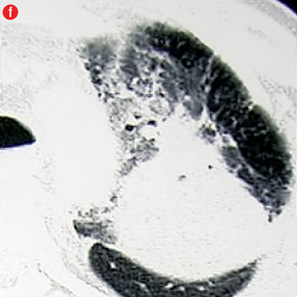 Aspergilloma within a preexisting cavity was seen in 55 (16.5%) patients. Also 251 of 334 (75%) of our patients were less than 50 years old. However, only 19 patients were younger than 20 years old, hence, the majority of affected individuals were young adults. The majority of our patients were males (76.3%). The standard of care embolization material for BAE today is PVA particles in sizes ranging from 250–700µm. PVA is effective and gives a long-lasting response compared to gel foam embolization.21 We used PVA in all our patients. Using PVA particles with a size above a threshold of 325µm, theoretically avoids broncho-pulmonary shunting. The disadvantage of PVA particles is the chance of clumping and proximal occlusion of vessels because of their non-spherical shape. There are increasing reports of using liquid embolizing agent NBCA for BAE.10 Use of NBCA requires optimal skill and knowledge regarding the concentration of mixture and speed of injection. With NBCA the future recanalization rates are said to be lower, but there is the disadvantage of closure of the main access artery often which may lead to sourcing of vascular supply from other arteries. 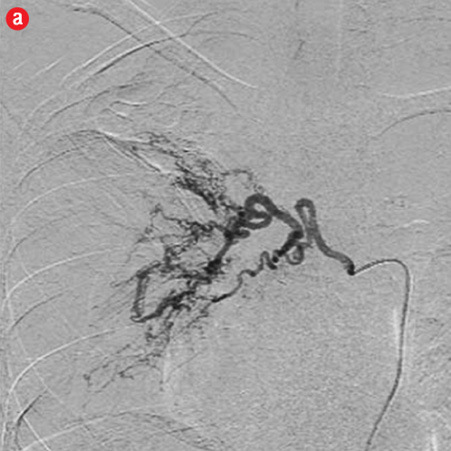 We confined the use of NBCA to cases of intractable or recurrent disease with large arteries. We interrogated all relevant arteries and, on the basis of the selective runs, those showing most severe changes (with a maximum four) were targeted for embolization in a single session. It was found to be effective in most cases and helped in saving procedure time and radiation exposure to both patients and operators. Previous authors had also reported to follow this practice with optimal results.23 In one patient the procedure was repeated electively, as he had multiple abnormal arteries that could not be adequately embolized in the first setting. Immediate clinical success could be achieved in the majority of our patients with 25 repeat procedures being performed within two months of the first procedure. Immediate control of bleeding was achieved in 93.5% cases. This result is comparable to results of previous studies.8-11,18 Repeat procedure within two months was performed in 25 (6.5%) patients due to technical or clinical failure of the procedure. This might be because of failure to identify or embolize bleeding vessels in the first setting or the nature of primary disease not responding to bronchial artery embolization. In four patients, cessation of hemoptysis could not be achieved despite repeat procedures. These comprised two patients of left upper lobe aspergilloma who subsequently underwent surgery. The other two non-responsive patients were of carcinoma lung. We did not achieve satisfactory results in carcinoma lung despite some previous reports of successful embolization.8 However, we only had two such patients. A comparison of recent studies on the effectiveness of BAE in immediate control of hemoptysis is given in Table 4. Table 4: Comparison of outcome of bronchial artery embolization in various studies. Inadvertent embolization of the spinal artery remains the most dreaded complication of BAE, but we did not encounter this complication in any patient. This can be attributed to the increasing use of microcatheters as has been mentioned in recent studies.8-13 With microcatheters, it is now possible to safely deliver the embolization material beyond the origin of the spinal arteries thus preventing this complication. We encountered only minor complications such as non-progressive localized dissection and chest pain. None of these required any active intervention apart from analgesics for two to three days in those with significant chest pain. We discontinued the procedure in cases of suspected localized dissection. These patients underwent repeat procedures in cases of accompanying clinical failure. BAE is a safe and effective procedure with a negligible complication rate that can be performed routinely in patients presenting with hemoptysis. It has an excellent short-term success rate and an acceptable long-term success rate. PVA is a safe embolizing agent, which can be used effectively alone or in combination with gel foam. Our approach of targeting only those arteries showing significant hypertrophy and blush, rather than all the relevant arteries, seemed to be effective. Mandalakas AM, Starke JR. Current concepts of childhood tuberculosis.SeminPediatr Infect Dis2005 Apr;16(2):93-104. Donald PR. Childhood tuberculosis: out of control?CurrOpinPulm Med2002 May;8(3):178-182. Winer-Muram HT, Rubin SA. Thoracic complications of tuberculosis.J Thorac Imaging1990 Apr;5(2):46-63. 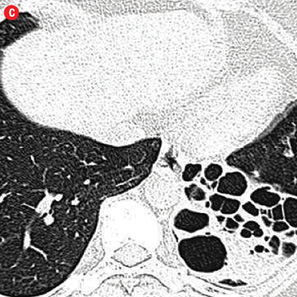 Kim HY, Song K-S, Goo JM, Lee JS, Lee KS, Lim T-H. Thoracic sequelae and complications of tuberculosis.Radiographics2001 Jul-Aug;21(4):839-858, discussion 859-860. ImJG, ItohH, ShimYS, LeeJH, AhnJ, HanMC, et al. 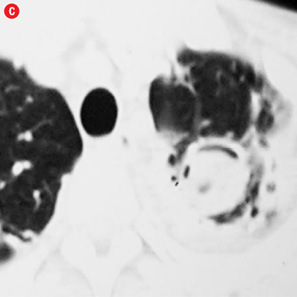 Pulmonary tuberculosis: CT findings–early active disease and sequential change with antituberculous therapy.Radiology1993 Mar;186(3):653-660. PamraSP, GoyalSS, RajB, MathurGP. Epidemiology of haemoptysis.Indian J Tuberc1970;17:111-118. ReechaipichitkulW, LatongS. Etiology and treatment outcomes of massive hemoptysis.Southeast Asian J Trop Med Public Health2005 Mar;36(2):474-480. FujitaT, TanabeM, MoritaniK, MatsunagaN, MatsumotoT. Immediate and Late Outcomes of Bronchial and Systemic Artery Embolization for Palliative Treatment of Patients With Nonsmall-Cell Lung Cancer Having Hemoptysis.Am J HospPalliat Care2013 Aug;31(6):602-607. RacilH, RajhiH, Ben NaceurR, ChabbouA, BouechaH, MnifN. 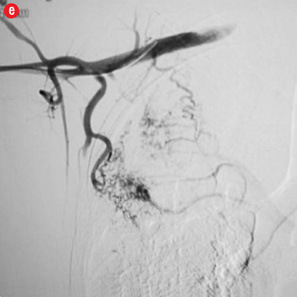 Endovascular treatment of haemoptysis: medium and long-term assessment.DiagnInterv Imaging2013 Jan;94(1):38-44. WooS, YoonCJ, ChungJW, KangS-G, JaeHJ, KimH-C, et al. Bronchial artery embolization to control hemoptysis: comparison of N-butyl-2-cyanoacrylate and polyvinyl alcohol particles.Radiology2013 Nov;269(2):594-602. ShinBS, JeonGS, LeeSA, ParkM-H. Bronchial artery embolisation for the management of haemoptysis in patients with pulmonary tuberculosis.Int J Tuberc Lung Dis2011 Aug;15(8):1093-1098. DaliriA, ProbstNH, JobstB, LepperPM, KickuthR, Szucs-FarkasZ, et al. 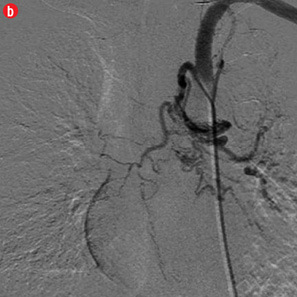 Bronchial artery embolization in patients with hemoptysis including follow-up.ActaRadiol2011 Mar;52(2):143-147. YooDH, YoonCJ, KangS-G, BurkeCT, LeeJH, LeeC-T. Bronchial and nonbronchial systemic artery embolization in patients with major hemoptysis: safety and efficacy of N-butyl cyanoacrylate.AJR Am J Roentgenol2011 Feb;196(2):W199-204. BhallaAS, GuptaP, MukundA, KumarA, GuptaM. Anomalous systemic artery to a normal lung: a rare cause of hemoptysis in adults. Oman Med J. 2012 ;27:319–22. BhallaAS, GuptaP, MukundA, KabraSK, KumarA. 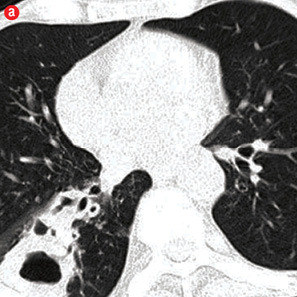 Pulmonary Artery Narrowing: A Less Known Cause for Massive Hemoptysis. Oman Med J [Internet]. 2013 Mar 16;28(2). Available athttp://www.omjournal.org/fultext_PDF.aspx?DetailsID=368&type=fultext. Accessed February 10, 2014. PoyanliA, AcunasB, RozanesI, GuvenK, YilmazS, SalmasliogluA, et al. Endovascular therapy in the management of moderate and massive haemoptysis.Br J Radiol2007 May;80(953):331-336. LeeS, ChanJW, ChanSC, ChanYH, KwanTL, ChanMK, et al. Bronchial artery embolisation can be equally safe and effective in the management of chronic recurrent haemoptysis.Hong Kong Med J2008 Feb;14(1):14-20. AgmyGM, WafySM, MohamedSA, GadYA, MustafaH, Abd El-AzizAE. Bronchial and Nonbronchial Systemic Artery Embolization in Management of Hemoptysis: Experience with 348 Patients. IntSch Res Not [Internet]. 2013 Aug 26;2013. Available athttp://www.hindawi.com/journals/isrn/2013/263259/abs/. Accessed April 30, 2014. SopkoDR, SmithTP. 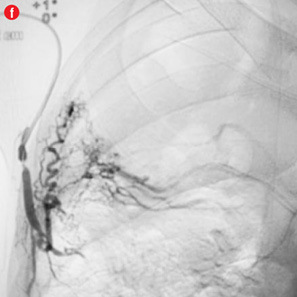 Bronchial artery embolization for hemoptysis.SeminInterventRadiol2011 Mar;28(1):48-62. IshikawaH, KimuraT, OyaA, KamitaniA, InoueY, SuzukiK, et al. 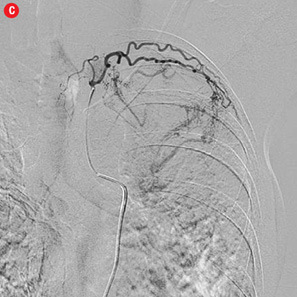 [Application of interlocking detachable coil (IDC) in superselective bronchial artery embolization].Nihon KokyukiGakkaiZasshi2004 Aug;42(8):730-736. HahnS, KimYJ, KwonW, ChaS-W, LeeW-Y. Comparison of the effectiveness of embolic agents for bronchial artery embolization: gelfoam versus polyvinyl alcohol.Korean J Radiol2010 Sep-Oct;11(5):542-546. YoonW, KimJK, KimYH, ChungTW, KangHK. 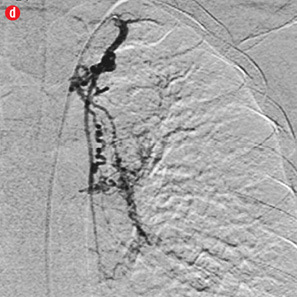 Bronchial and nonbronchial systemic artery embolization for life-threatening hemoptysis: a comprehensive review.Radiographics2002 Nov-Dec;22(6):1395-1409. RamakantanR, BandekarVG, GandhiMS, AulakhBG, DeshmukhHL. Massive hemoptysis due to pulmonary tuberculosis: control with bronchial artery embolization.Radiology1996 Sep;200(3):691-694. ZhangJS, CuiZP, WangMQ, YangL. Bronchial arteriography and transcatheter embolization in the management of hemoptysis.CardiovascInterventRadiol1994 Sep-Oct;17(5):276-279. Garcia-OlivéI, Sanz-SantosJ, CentenoC, RaduaJ, AndreoF, SampereJ, et al. Predictors of recanalization in patients with life-threatening hemoptysis requiring artery embolization.Arch Bronconeumol2014 Feb;50(2):51-56.